When you arrive you will find that our architect maximized light, air and views, with great flow from the upstairs vaulted bedroom ceilings to the open plan downstairs. The spacious front and back decks overlook seasonal gardens with gorgeous landscaping and neighboring woods. From daffodils to hibiscus, we designed our organic gardens for lots of color throughout the spring, summer, and fall seasons, attracting abundant wildlife. We are in a great location. Walk along protected wetlands to lovely Forest Beach, where you can find your own stretch of sand away from the crowds. It's also a short stroll to a great cafe and wonderful upscale restaurant. Each of the three bedrooms has its own bathroom, TV, DVD, and radio/Iphone port. We have two separately zoned central air and heating systems (one upstairs and one downstairs) for your year round comfort. The master suite has a tempurpedic queen bed and full bath. The other two bedrooms can be made up as twin sets or king, and contain all new pillow top mattresses with hotel quality linens. There is a ping pong table in our basement rec-room/art studio, and even beach chairs and towels are provided. Our home is also handicap accessible, complying as much as was possible to ADA requirements on the entire first floor. Both front and back decks are wheelchair accessible. The downstairs bedroom flows into a shower bathroom with grab bars and also grab bars around the toilet. The upstairs back bathroom with shower also has grab bars. The upstairs bedrooms have a lofty feel with lots of windows and light. We also welcome well-behaved dogs. We just ask that you pick up your pet poo please for the folks who follow you. Our living room has two six foot sofas, two comfy club chairs and an extensive library for all ages. This is a great room to entertain and enjoy a book, game, or bingewatch movies with a nice fire. This space flows into a brand new cook's kitchen, fully equipped with whatever you may need for any kind of feast. We have ample dishware and cookware for you and all your guests - no foraging for a corkscrew here! All of our appliances are top quality, including an extra full size refrigerator/freezer in the basement for your overflow drinks and produce. An eight to ten minute walk from our front door leads you to Forest Beach on Nantucket Sound for swimming, birding, and water sports. If you want to drive your gear down there, parking is free. Following Forest Beach or the marsh path towards Chatham town, you will find our beautiful estuary. Watch the tides come and go, enjoy the shells and other ocean treasures at low tide. Go the other way on Forest Beach Road and you can easily walk to the Talkative Pig restaurant, Pisces Restaurant, the Cape Cod bicycle path and Highway 28. A ten minute drive takes you to the Cape Cod National Seashore and all kinds of beaches, both fresh and salt water ponds, and eateries. We also enjoy a small public park, a five minute walk from our front door, which includes a tennis court, basketball hoop, and jungle gym for the little ones. Our neighborhood is quiet and safe, with woodsy shortcuts between beaches and plenty of nature for the whole family to explore. Our own gardens are organically grown and we include numerous native plants as well as the old favorites, with a nice lawn and eye for seasonal color changes. Winter is stark, with long views and excellent mix of tree and bush forms that can only be glimpsed when the leaves fall. Photographers come from all over the world for the unique Cape light during these months. Our expansion of the original family home has created a wonderful and workable vacation getaway, where groups can gather for fun and scatter for privacy. In addition to the three bathrooms, we have a spacious outside shower with ramp and grab bars, and there is ample off street parking. The ping pong rec room in our basement shares the space with a large laundry area and art studio with lots of natural light. At every turn we have provided for our renters all those comforts that we ourselves enjoy, with amenities that will exceed your every expectation. Once you have experienced Paul & Mary's Place, you'll never want to go anywhere else. I am an artist, mostly painter, specializing in wildlife, such as endangered species, and pet portraits. I have been lucky to enjoy both coasts, living most of the year in Redondo Beach California. My husband and I inherited the original home from his family and we began our remodeling in 2007. Mostly I enjoy the fresh water pond swimming - this is not to be had where I live in LA and I love watching the trout and turtles swimming around in that spring fed environment. I also adore eating seafood and the Cape has the best. At this time of the year we are known world-wide for the unique "Cape Light" that photographers prize. Check out the way light bounces off the tidal flow as it makes the shore. My husband enjoys the walking trail behind the dunes at the end of Forest Beach Road that has sweeping views of the tidal wetlands. It has a lot of protected nesting spots for large and small birds. It ends at an estuary that runs into Taylor Pond, a quiet peaceful respite with only the sounds of gulls and waves on the beach. We had a WONDERFUL stay at Martha's beautiful home! She has truly thought of everything! This home does not feel like a rental at all! The entire home and all of its contents are there for your use - including beach gear, towels, bed linens, kitchen items (spices and all)! We loved the layout of the house. Every room has a bathroom (one is en suite, other 2 are in hallway beside room). The basement laundry, ping pong table and additional living area were much appreciated! The home was EXTREMELY clean and well-maintained. The yard was beautifully manicured! We loved the quiet neighborhood which was nice for walking our dog. The beach is nice and only about a 10 minute walk away. The central location of this home is perfect for making trips to the other areas of the Cape. Martha was the perfect hostess! She was quick to respond to my phone call when I had a problem upon check-in and immediately had it corrected. She maintained contact with me prior to our stay to make sure that we had everything that we needed. Check-in and check-out couldn't have been easier! It's a rare place that doesn't have all kinds of requirements that you must do prior to leaving. We appreciated not having to complete a check list on a day that's already hectic. We would DEFINITELY stay here again! Thanks, Martha! Wow we live for reviews like this, I feel like you really get me! Andrea was also the ideal guest, and I sure hope she comes back. This Southern gal has never understood why some homeowners require their guests on vacation to be housekeepers last day, we want you to feel like you have been guests in our home with all the bells and whistles. We don't lock up anything and we want you to have everything you need. In this case I feel so appreciated...thanks again for choosing Paul & Mary's Place. We had a lovely weekend getaway with my in laws. The location and house were perfect for our needs. We’d definitely visit again! Perfectly situated for our weekend of exploring the towns of Chatham and Harwich Port. The home has everything you could possibly need! The house is in a convenient location in a quiet neighborhood. It is very well equipped with good and abundant linens, Bosch appliances, excellent showers and comfortable beds. It is roomy, light and airy with excellent windows. It was nice to have a key pad and not have to deal with keys. The day ferry to Nantucket was nearby and in a charming harbor. The owner was responsive and gave good instructions. About the only negative is if you want to be right on the water. Thanks to the owners for facilitating a nice girls' biking getaway. 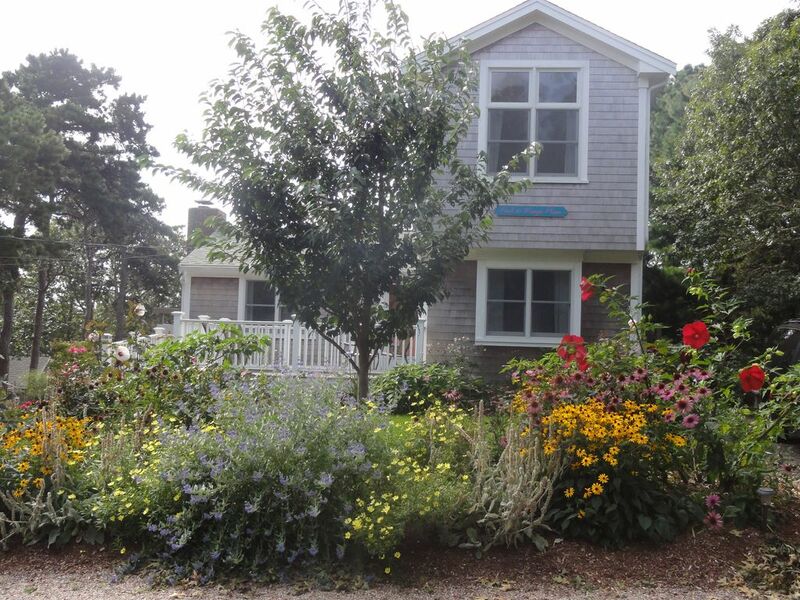 Two miles to ferry boats to Nantucket Island, easy drive to boat tours of Monomoy seals and outlying islands, day trips available to Martha's vineyard, lots of art galleries nearby.